If you’ve been around these parts before you will know about my love for Netflix, I’ve spoken about it on numerous occasions on my blog and on my YouTube channel. Whether that be a favourite show, or just generally raving about the joy of binge watching. However, one of my favourite genres that I haven’t touched too much on here on my blog is documentaries. I love learning about aspects of life that I have no concept of like drug trafficking or imprisonment, or about historical events before my time or delving into a tough true crime story. As I have now sampled quite a few of the documentary films and series that Netflix has to offer, I thought it was about time I compiled a list of what I believe to be the best Netflix documentaries. In no particular order of course, that really would be too hard to choose! If you have Netflix and haven’t watched this yet, make it your first priority! For those of you that have seen it I’m sure you will agree it is one of the best Netflix documentaries. For those of you that haven’t, it’s the story of a man who is currently in prison for murder, one that he may or may not have committed. The evidence presented is completely shocking and really makes you question the police and other suspects. I don’t want to give too much away though as you need to make your own decision about whether he is guilty or not, I’ve definitely made mine. It’s a multi-episode documentary and every single one leaves you desperate to binge watch the rest, so get started and you will not be disappointed if true crime is your thing. Now this one wasn’t something I found, this was Luke’s choice one day. But as I love visiting castles I thought hey why not, let’s give it a whirl. Each episode focuses on a different castle around the UK, exploring it’s history and all they key events that have happened through its lifetime. There are 2 seasons and 12 episodes, each around 45 minutes long. And I’ll be honest, this one surprised me, it’s fascinating! I think in part due to the fact that the presenter isn’t a stuffy older guy as most history shows tend to be, the presenter Dan Jones is a young guy with tattoos. It sounds superficial but the way he presents it makes it so much more interesting that other history shows I have seen. If British history is your bag then be sure to check this one out. 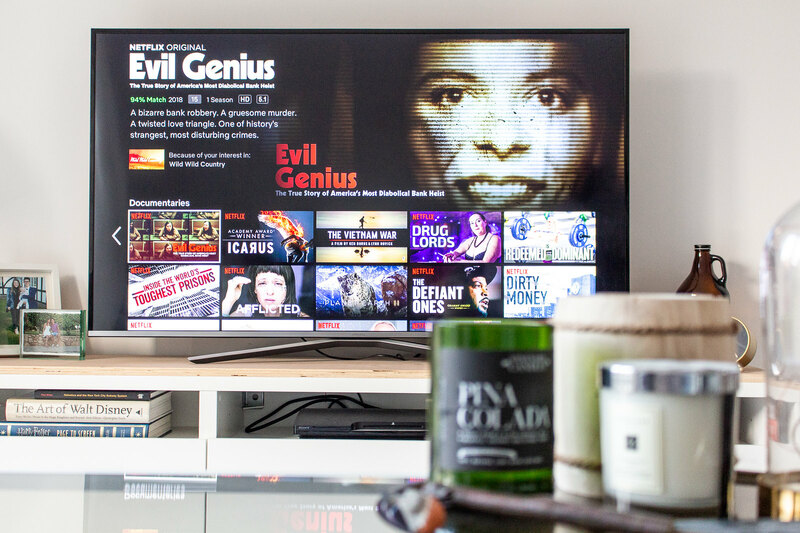 When it was released, Evil Genius kept popping up on one of my banner ads when I opened up Netflix, so as I was drawn in by the advert I thought it looked like another great true crime documentary. Another series style documentary, this time 4 episodes between 45 minutes to an hour long. It starts off with the story of the ‘pizza bomber’ where a man goes to rob a bank and then afterwards when caught by police, reveals a bomb strapped to him with a collar around his neck. This is where it all starts to get so convoluted and crazy. Again, I don’t want to reveal anything but all the twists and turns will have your head spinning. Another amazing true crime choice. When Wild Wild Country was released I remember there being a big fuss about it. I watched the trailer and was a bit like ‘eh, could be for me but I’m not desperate to watch it’. So it sat on my list for a while. A couple of weeks ago when I had finished everything else I was watching I figured I’d try it out. Oh my good god, it is good! I was actually three episodes in when Luke (who had been half watching it over my shoulder) said ‘oh this looks really good, can you start it again with me. Meaning I have now watched the first three episodes twice, but I think this was kind of beneficial as I picked up things I had missed the first time around. Because SO. MUCH. HAPPENS. Honestly every episode left me thinking ‘what the hell is going on? !’ It’s shocking. If you have no idea what it’s about it’s the story of this ‘cult/religion’ from India that took over a small town in Oregon back in the ’80s, and everything that happened from then on. It’s truly gripping and such a crazy story that I had never even heard about before. 100% one of my favourite things I’ve watched on Netflix this year. I have always been fascinated by anything to do with US presidents, and the assassination of JFK, followed by the assassination of his brother Bobby has been something I have looked into in the past as the Kennedys seem to have a certain reputation in America. This documentary has 4 episodes and looks at Bobby Kennedy pre-JFK assassination, post-JFK assassination and his subsequent run for presidency, and closes with his own assassination and legacy. In any interviews/articles I have seen about Bobby I always thought him to be a nice guy and this further solidified this feeling in me. It’s such a tragic story and I truly believe the path of American politics and the future of America could have been very different had Bobby made it president. A fascinating watch if you have any interest in American history or politics. I first watched this series when it was released but last week I watched it again with Luke as he didn’t watch it the first time with me (can you notice a theme here? Luke never wants to watch stuff, half watches it over my shoulder, and then wants me to watch it again with him). The Keepers tells the true crime story of a nun that was murdered in the 1960s in America, and the story behind her murder (which has never been solved). The back story involves the sexual abuse by priests in the Catholic church towards children under their care in schools and the church. This is a topic that has really affected me ever since I watched the film Spotlight back in 2016. Which if you haven’t seen, I would also hugely recommend as it is based on a true story. The Keepers at the same time fascinates and angers/disgusts me as I cannot believe these horrific things have been allowed to happen. It’s a story that needs to be heard so that the victims can all get the justice they deserve and these things can never be allowed to happen again. An absolute classic. If you haven’t heard of Louis Theroux, have you been living under a rock? This guy is documentary genius. His subtle and non-confrontational manner means that even the hardiest of criminals tell him anything he wants to hear. From the most hated family in America to Nazis to dementia, Louis’ various documentaries have touched on all of the topics you could imagine. And there are so many different episodes to choose from on Netflix (naturally I’ve watched them all), these documentaries will keep you occupied for days. An absolute must-watch if you love a good documentary. Are there any other documentaries you love on Netflix? Next up on my list are Icarus, Dirty Money and One of Us.